Contract Details: 2014/15 Asian Champions League contract. Rejoined club on 2 year deal 24/8/16. Released January 2016. Highlight: Scored two goals on debut in the Sydney Derby. Description: A talented young striker who had the early part of his career marred by off-field controversy. His first stint at the Wanderers career burned bright, quickly becoming a supporter favourite for his passion and goal scoring ability only for a rumoured falling out with the senior playing staff & coaches seeing him leave the club at the conclusion of his first and only season in the Red & Black. 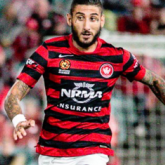 After a horror run for Iraklis he initially came back to the Wanderers for a short trial before signing a 2 year deal. His second coming lastly little more than half a season as he fell victim to Tony Popovic's notoriously short fuse and joined Andrew Redmayne in being punted from the club in January 2017. I'm all over it already. I couldn't think of a better option for the guy, getting back into the NPL - just not NSW though, because his idiot mates will just drag him down again. Take a punt mate, head down to Victoria and get onto a team there & work your way back up. Or take a bigger punt and go over to WA and do the same thing. Bangs 30 goals in the NPL, signs for South West Sydney, scores winner in the first West Sydney Derby. Taurus got me hanging on here like a judge adjourning a court to decide on a brother's fate. He didn't figure on the scoresheet for MDTR, in their 4 - 1 trial win over the weekend. As far as I'm aware, he's on trial whilst the two parties determine whether they are a good fit for one another. As far as I'm aware, he's on trial whilst the two parties ﻿determine whether they are a good fit for one another. just so im on the same page Taurus - is that trial with MDTR or WSW? So why would you pick someone who has failed everywhere he has played? He can teach the kids at drivethru then. Still around Sydney I hear. I don't do Instagram which is apparently the best place to see where he is. Where is our Kerem ? How good would Kerem be under Babbel ? But it does make a nice story, a fairy tale like Haensel and Gretel that some enjoy going back to: was a promising youth player, then did stuff all apart from avoiding jail, comes back to Sydney and scores 6 goals in 18 minutes, one of them in the smoke, got himself arrested while trying to eat a burger, did stuff all again, then celebrated a goal that wasn't one, and the one thing he has done since is coke. Calling him poor man's Pio would be an insult to Pio. 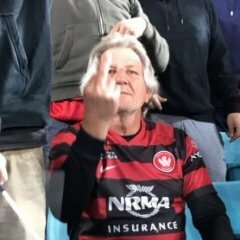 He'll never get a job again at WSW. Haensel and Gretel were at FC Neunburg weren't they? Hey don't oversell Pio. Bulut had double the goals per 90 minutes that Pio did and that includes his dud second season. 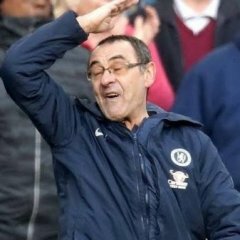 I still maintain that if and in form Bulut had stayed with us into the 15/16 season instead of us signing Pio and we used the visa spot elsewhere in our starting XI we would have won the league that year. We only just missed the plate, made the grand final and even if Bulut failed it'd be no different to Pio failing, except we'd have another visa player in our squad. In saying that, he wasn't the same player when he came back and the club was right to part ways with him. And so the myth is kept alive. Kerem was shown the door because he blew up the locker room. He was baccus snr on steroids. Pio knew when the time had come to only open his mouth for ice cream consumption, Kerem may want to pay attention to that. What Kerem needed was a personality makeover a decade ago. Instead he became a toxic player who is a risk to every club.